For a brand that didn’t even exist five years ago, Calibre Bikes has shot to stardom pretty darn quickly. In its short history, the company has been breaking new ground in the mountain bike market with its mix of low-cost high-performance bikes, with the popular Bossnut full suspension bike leading the charge. 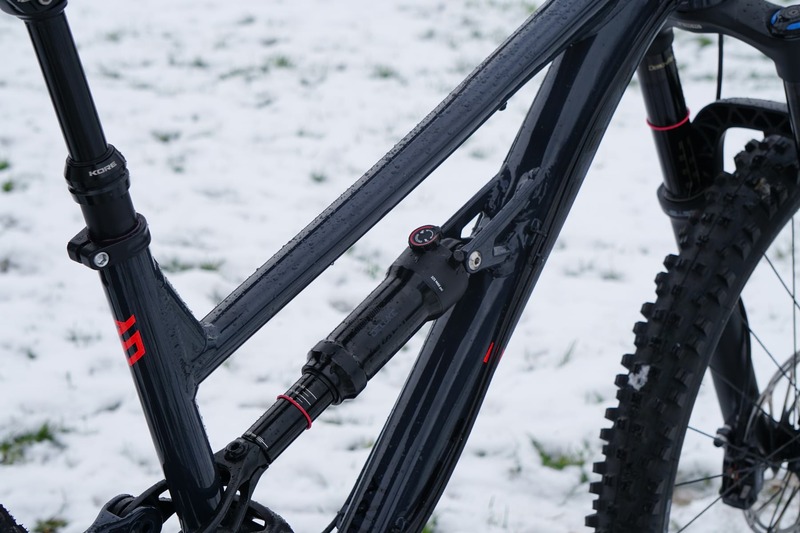 This £999 full suspension bike has been collecting awards from the industry since its first release and even managed to earn the coveted Singletrack Readers award in 2018. The Bossnut’s success meant Calibre had the confidence to release the Triple B version of the Bossnut and the Beastnut – bikes with the same award-winning frame, only built with more upmarket components. The Bossnut and its variants remain popular trail bikes, but what about the customer who has outgrown the speed and performance of the OG Calibre full-suspension bike? What about the customer looking to hit the trails harder, faster and further? 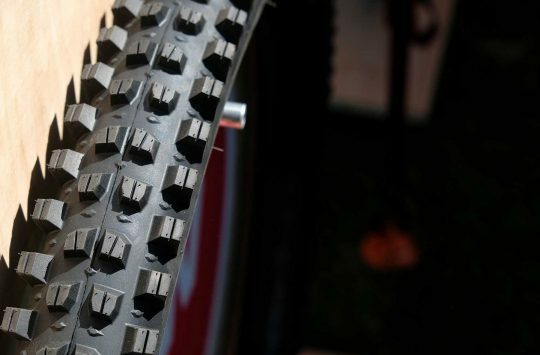 Riders who could perhaps benefit from more travel, more progressive geometry and larger 29er wheels? Snow? Yup, we’ve had the Sentry on test for quite some time already. 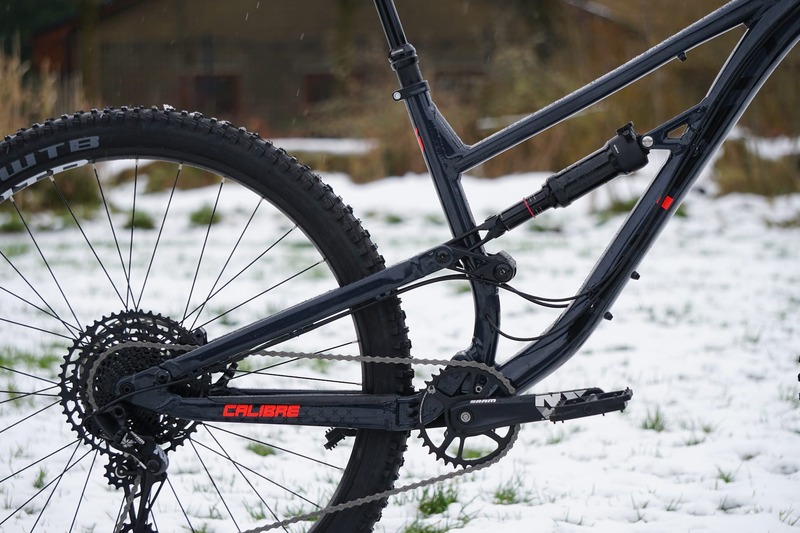 Calibre’s answer is this, the all-new Calibre Sentry, a bike that the Calibre team reckons you could buy at the store, build in the carpark and race in the EWS on. There are two specification options. 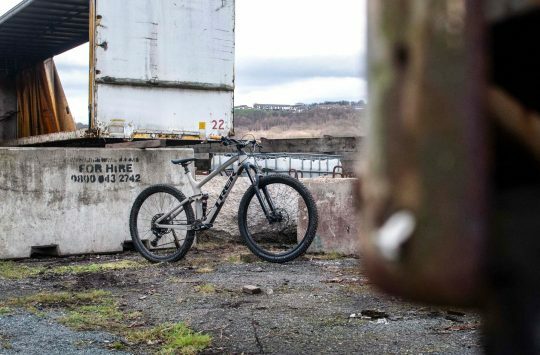 Our test bike is the entry-level Sentry and costs just £2,000. For customers really serious about racing there’s also a Sentry Pro built with go faster red Lyrik RC2 forks, Super Deluxe Coil shock with remote, SRAM GX Eagle and a £2800 price tag. 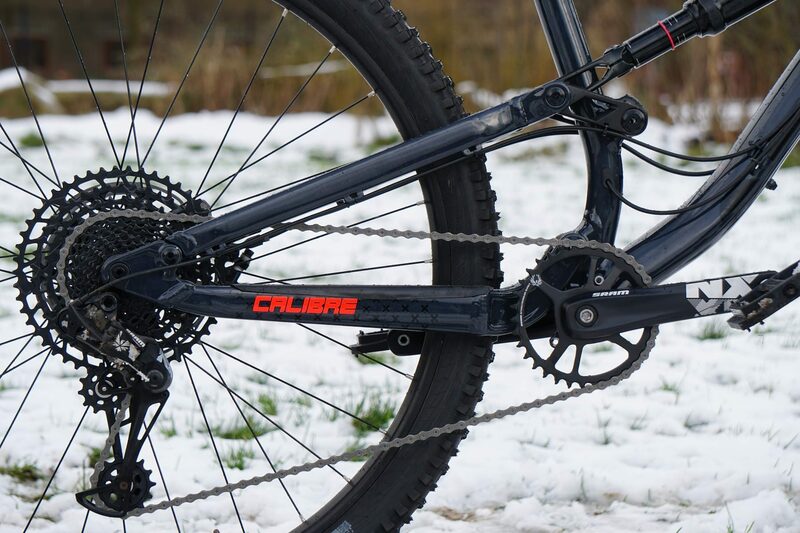 Calibre is so confident that the Sentry Pro is EWS ready that they’ve sponsored Chloe Taylor who will use an off the peg bike to race the 2019 EWS season! 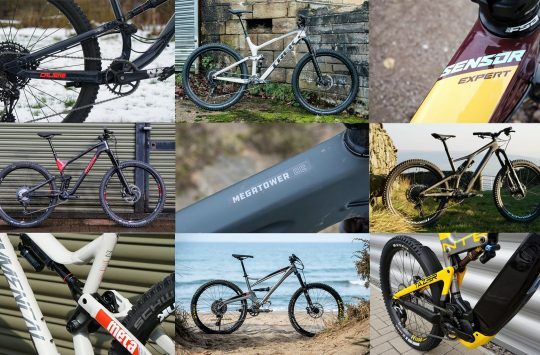 At £2,000, the Calibre Sentry comes is up against comparable bargain big travel bikes like the Canyon Torque AL 5.0 (£1,999), Commencal Meta AM 29 Ride (£2,128), and the YT Capra 29 AL Base (£2,299). 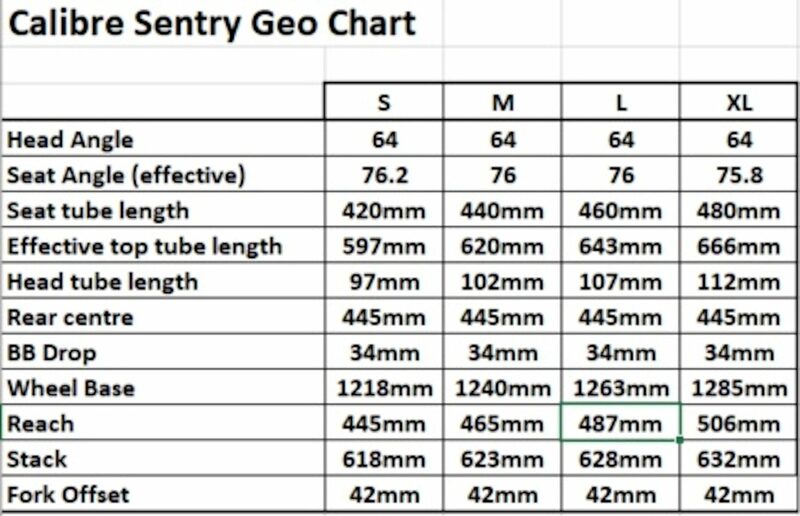 The difference between those three bikes and the Calibre though is that the Sentry is available in store in most major towns where you can physically see it. 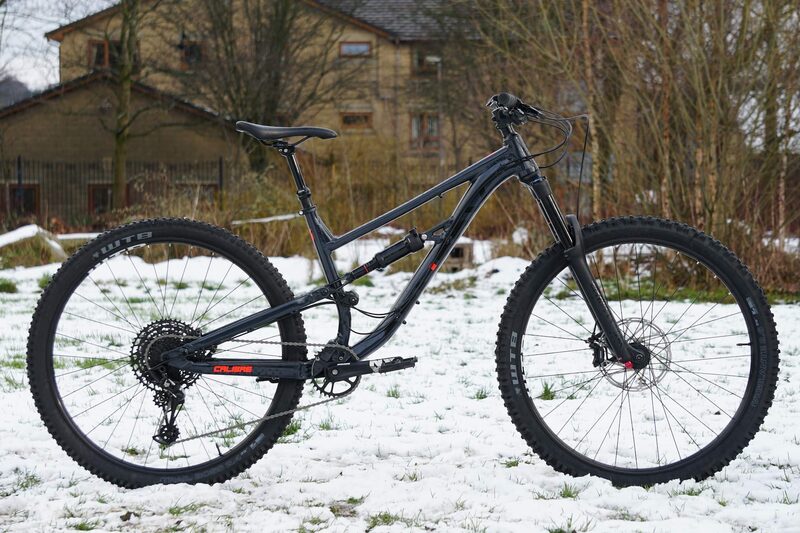 It also has larger wheels than the Torque, and it’s notably cheaper than both the Commencal and YT. Right, let’s take a closer look at the Sentry’s key ingredients. The Sentry is brand spanking new. Whereas the Triple B and Beastnut used the same frame as the Bossnut, something else was needed when creating the Sentry and Calibre started with a fresh pad of paper, a new drawing board and a handful of box-fresh 2H pencils to come up with this. The RockShox Deluxe R doesn’t get a climb switch, but I never felt the need for one either. 6061 T6 aluminium tubing is used for the mainframe, and rear triangle. The two structures are bolted together with custom CNC machined alloy linkages running on sealed bearings to give the Sentry 150mm of rear wheel travel via a RockShox Deluxe R air-sprung shock. The Sentry puts the ‘PRO’ in ‘Progressive’. 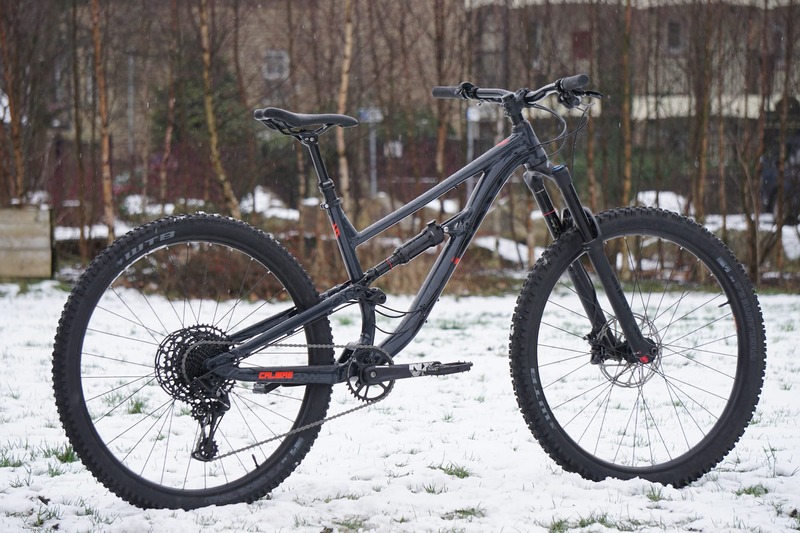 It’s not uncommon these days to come across a modern 29er enduro bike following the on-trend long, low, slack recipe, but Calibre has really gone the whole hog with the Sentry. 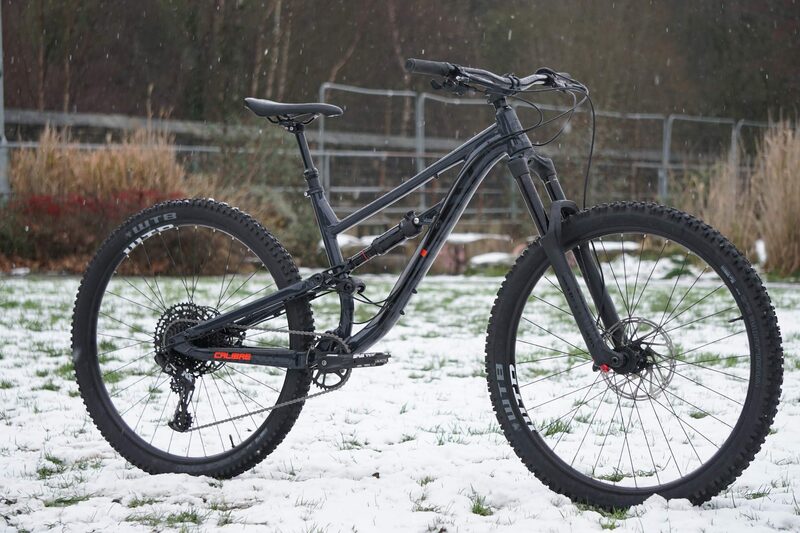 Reach figures on this all-new bike range from 445mm on a small (yup a small!) up to 506mm on an XL frame. Long reach is combined with a short seat tube length across the entire size spectrum for ample standover giving customers plenty to think about when choosing the appropriate size but it also means that riders normally stuck between sizes can easily size up. With long and low sorted, Calibre needed to check the slack tick box, and it’s done so with a 64° head tube angle. Also of note is the short 42mm fork offset, which is there to add further stability to the front wheel when riding flat-out down steep trails. It ain’t Pole long but it also isn’t Pole price. A 76° seat tube might not be as steep as a Pole, but it’s enough for a comfortable seated climbing position and ensures your saddle is well out of the way once that Kore dropper is activated. At 178cm I tend to find myself sitting right between a size medium or large bike, and as brands chase that geometry dragon I find that I seem to be forced toward a large. With a reach of 465mm though, a medium Calibre Sentry sits slap bang in my happy place. If I was more interested in jumping and playing around in the woods then I might even consider a Small. Subtle decals on the Sentry. 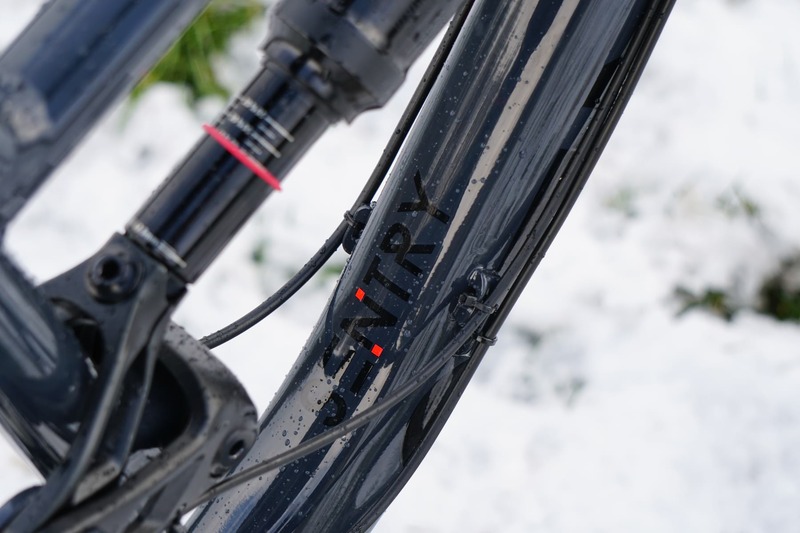 Looking at the Calibre Sentry’s frame details we find external cable routing throughout, which saved Calibre some money when building the bike and will save you a lot of time if you ever need to change a cable or hose. Cable and hose routing is neat, with plenty of zip tie locations to keep any excess in check, there are even neat cable mounts on the suspension linkage. Inboard rear brake mounting keeps the rear calliper out of harm’s way. There’s Boost spacing, a bolt thru axle and a really neat inboard rear brake calliper mount. All great features on any bike, but especially impressive on such an affordable complete bike. Complimenting that 150mm of RockShox controlled rear travel is 160mm of front wheel travel via the RockShox Yari RC fork. RC means we have a Charger damper, rebound control and compression adjustment, but for the serial upgrader, the Yari also means the same chassis as a Lyrik and the possibility of fitting an upgraded damper at a later stage. A 45mm Calibre stem clamps to an 800mm wide Kore handlebar for max control. A 45mm Calibre branded stem holds the 800mm Kore Duroc handlebar, which is plenty wide enough and has markings so you can neatly chop them down to your preferred width if required. Those wide Kore bars are also the perfect place to attach a set of SRAM Guide RE brake levers. I really like the length and feel of the SRAM lever blade, especially when fitted to a set of four-pot callipers. The Guide RE levers don’t have the same adjustment as more expensive Guide options, but they still offer great control. 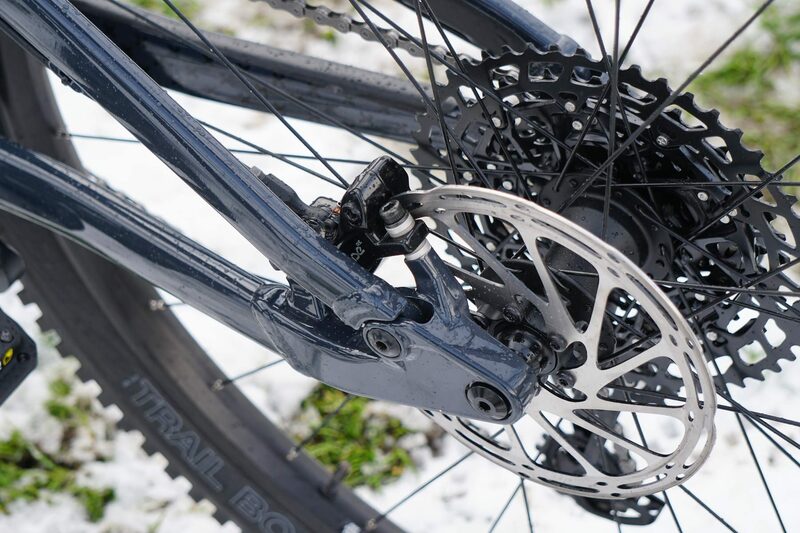 1×12 provided by SRAM’s affordable NX Eagle drivetrain. SRAM gets even more screen time thanks to a SRAM NX Eagle 12-speed shifter cabled up to a matching NX Eagle rear mech to slide an NX chain across the 11-50t NX cassette. That cassette is a monster, in more ways than one. It offers plenty of gear options, but it also weighs in at a whopping 613g, more than a GX Eagle and more than a similar 12-speed SunRace option. Calibre has matched the rest of the drivetrain to a SRAM chainset, but this is an NX Eagle Power Spline model with old skool internal bearings instead of the external cups we’re more used to seeing. It’s one of the only obvious cost-cutting measures on the bike but hasn’t caused problem or concern during our test period. 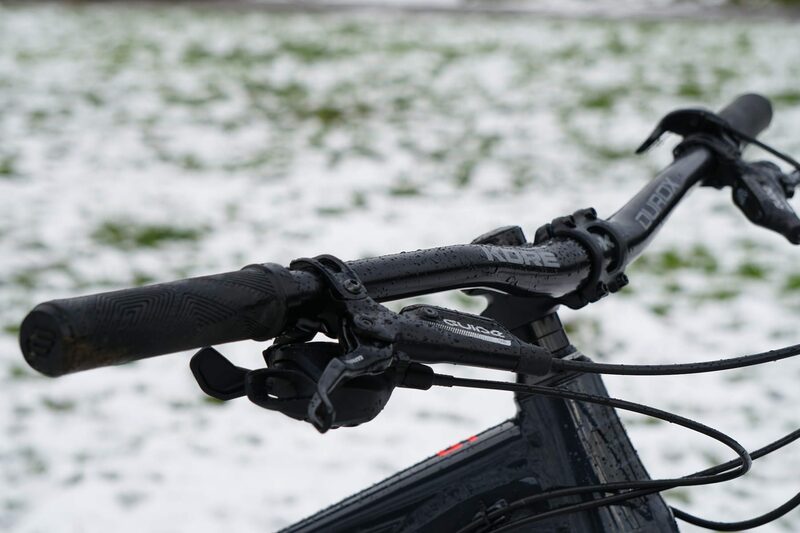 A Sentry branded saddle lives on top of a Kore 150mm dropper post. 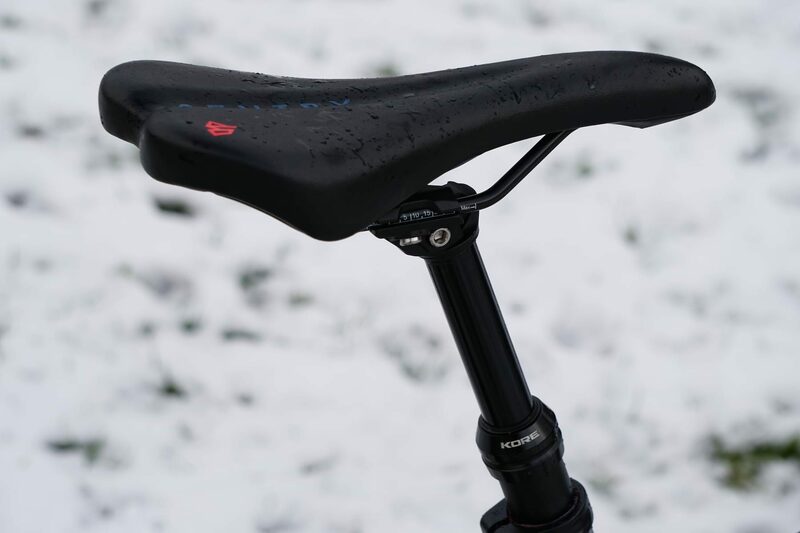 For those moments you’re not smashing the ruts, there’s a Calibre Sentry branded saddle to perch on. It’s nothing special but it is very comfortable with plenty of padding. Beneath the generic saddle is a Kore Mega Stealth dropper post. This stealth routed dropper offers 150mm of travel but with the shorter seat tube, a longer drop might be necessary for taller riders. The Kore Mega Stealth is cable operated and has an over bar lever, not my preferred choice and something I’d swap out pretty sharpish. The Sentry rolls on chunky rubber. Last but not least are the wheels. Calibre is pretty proud of the fact that they’ve managed to spec the Sentry with quality WTB tyres with tough casings. We have a 2.6in Vigilante TCS G2 Tough Grip 2.6in in the lead and 2.4in WTB Trail Boss G2 high grip in the rear. Each WTB tyre is mounted to a WTB ST i29 TCS rim that’s laced to Boost Formula hubs. Phew, that’s the lot! So how does it ride? Frame // 6061 Alloy 150mm travel. 148 x 12mm. Fork // RockShox Yari RC 160mm 42mm offset. Hubs // Formula sealed bearing Front 15mm, Rear Formula 12mm. Rims // WTB ST i29 TCS 2.0. 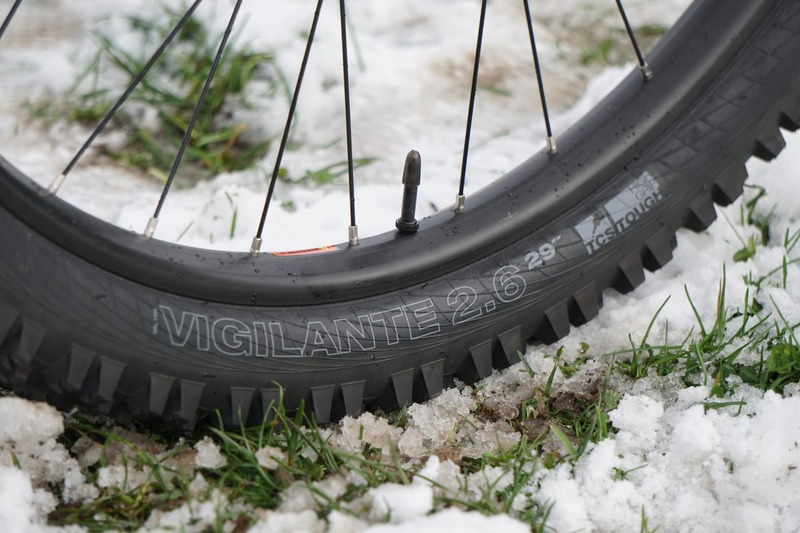 Tyres // WTB Vigilante TCS G2 Tough Grip 2.6in Front, WTB Trail Boss TCS G2 Tough High Grip 2.4in rear. Chainset // SRAM NX Eagle Power Spline 32t chainring. Rear Mech // SRAM NX Eagle. Shifters // SRAM NX Eagle. Cassette // SRAM NX Eagle. Brakes // SRAM Guide RE 4 pot 200mm rotor front, 180mm rotor rear. Stem // Calibre Trail 45mm. Bars // Kore Duroc 800mm wide, 20mm rise. Seatpost // Kore Mega Stealth 150mm dropper. My first Calibre bike was an Astronut (still is) and for the money, it’s a really well finished piece of kit. Apart from the value, its’ also a good looking bike! Just a good job I’m not in the market for a new one…. This begs the question; are other bikes just overpriced? Fair play – that looks spot on! Have to echo everyone else above – what a great looking and great value bike.